As part of Notre Dame Commencement this year, we conducted a number of tests on various digital video hardware and software. This is a summary of the testing performed with the AJA KiPro. Digital Video Pilot – Tapeless video workflow for Notre Dame Commencement. Using an AJA KiPro to record an Apple ProRes 422 10bit video file, directly to hard drive for editing within Final Cut Pro. One of the greatest potential workflow improvements is the elimination (or reduction) of tape-based video workflows. The process of recording directly to videotape makes it necessary to either encode the tapes or render them into Final Cut Pro for post-production editing or online delivery. The goal is to use an AJA KiPro Standard recording device installed at the Notre Dame Stadium to capture directly to hard drive the full Notre Dame Commencement ceremony in Apple ProRes 422 10bit NTSC format for ingest into Final Cut Pro. 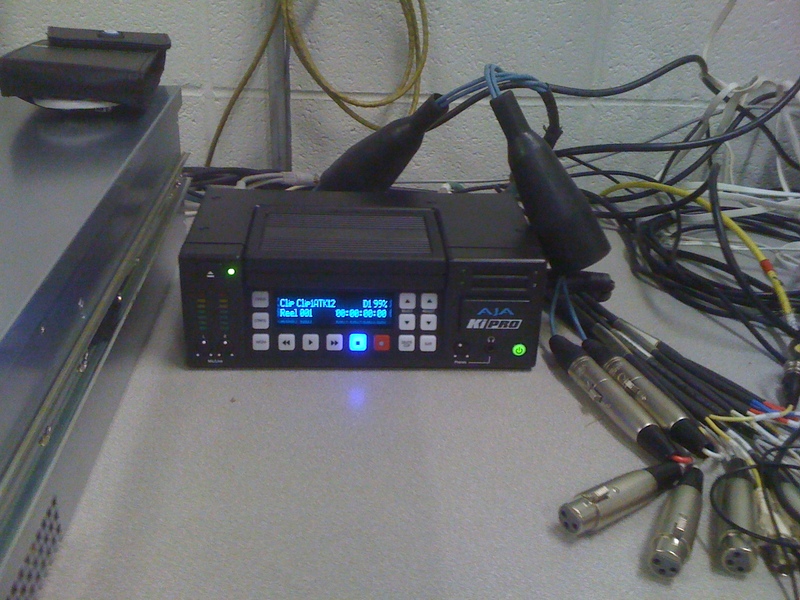 The AJA KiPro will take an SDI video and balanced (L/R) audio feed from the contracted production truck. Initially, the plan was to only record the commencement speeches. However, it was determined it might be best to record the entire commencement ceremony, due to some concerns with file formats and sizes for the uncompressed video files to be captured by our contracted production company. Reduce the ingest timeline – Expedite the ingest time it takes to get the commencement speeches from production into Final Cut Pro. Extrapolated to other events, this results in a significant reduction in the existing workflow, ultimately saving money and resources and improving efficiency. Quality improvements via born digital – The degradation induced by encoding tape to digital file format or rendering video is marked. Recording directly to hard drive using the Apple ProRes 422 10bit format provides the added benefits of starting with a high quality, slightly compressed file format for the digital video workflow. Usability – The AJA KiPro is a compact and rugged hard drive record deck that should prove easy to use by any existing production personnel. With very little effort, the device can also be installed on the campus data network, either wired or wireless, for remote access and recording. The AJA KiPro will make a nice addition to digital video production at Notre Dame. An Apple ProRes 422 10bit NTSC digital video file recording of the entire commencement was produced using the AJA KiPro. The AJA KiPro was simple to test, setup and operate, and proved to be so successful that it has being used for more than the initial intentions of this project. The only known problem with the evaluation were audio levels that were slightly low, which could have been increased with an adjustment on the AJA KiPro, these were raised in the post production process. 15 minutes – Time to offload file from AJA KiPro to local machine running Final Cut Pro, compared to almost 3 hours with existing process. 80 minutes – Time to upload to DV server running Final Cut Server in OIT Operations. This is a new part of the workflow. To conclude, we decided the testing of the AJA KiPro was such a success, that we have plans on purchasing a few of these to get us into a file based digital video workflow.